The Wanlockhead Beam Engine stands beside Wanlockhead's Church Street, a cul de sac that descends from the north west of the village past a series of reminders of its lead mining past. 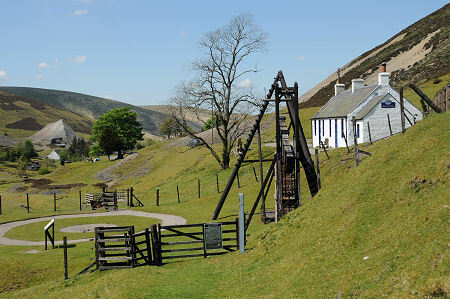 The engine is included in tours undertaken by the excellent Museum of Lead Mining from its base in the centre of Wanlockhead, or it can be visited separately. 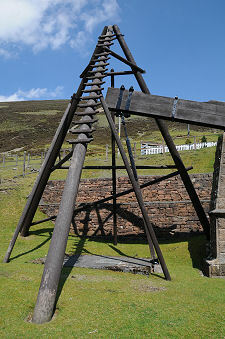 The beam engine, also known as a water bucket pumping engine, is almost all that visibly remains of the Straitsteps lead mine, one of the smaller and older of the mines in and around Wanlockhead. The mine was opened up in about 1675 by Sir James Stampfield. It comprised a vertical shaft descending to the lead vein, which was then followed by horizontal tunnels. Today the top of the mine is covered by the concrete slab which can be seen beneath the left hand side of the beam engine in the header image. Flooding was a perennial problem in the area's lead mines (and most other mines). 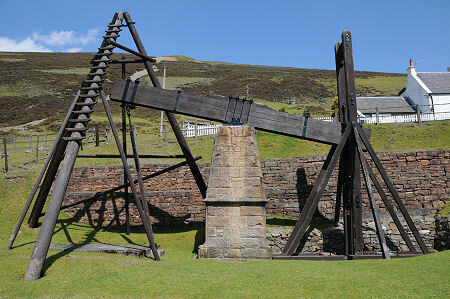 Initially this was tackled at Straitsteps Mine by hand operated "rag-pumps". These comprised a continuous loop of rope with rag bundles attached at intervals. The rising part of the cycle was contained within a tube whose bottom was below the water level, and as a result the bundles of rags each pushed a quantity of water up the tube, from the top of which it could be drained away from the mine. By the early 1700s the hand powered rag pumps were replaced at Straitsteps by waterwheel powered pumping engines. In 1745 a new and (though it doesn't obviously seem it) much more efficient technology arrived in Wanlockhead with the introduction of waterbucket and beam engine pumps. 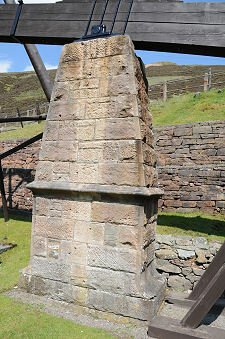 These were widely used, but the Wanlockhead Beam Engine is the only example that can still be seen in the UK on the site on which it was originally erected. This particular example seems to have been built in the 1870s, and continued in use until the mine closed in the early 1900s. Today it is cared for by Historic Environment Scotland. The engine worked by harnessing the flow of a stream which was collected in a tank on the hillside above, before being directed via a culvert under the nearby road. 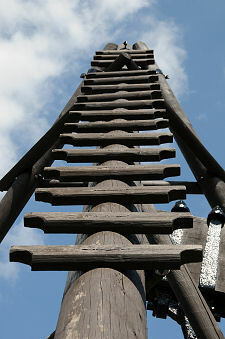 It then flowed into a box-like wooden bucket below the right hand side of the beam as seen in the header image. The weight of the water pulled down this end of the beam, and raised the other end. As this was attached by rods to the pumping mechanism in the mine below, the weight of a large amount of water pushing down one end of the beam effectively forced a smaller amount of water up a much greater distance to where it could be drained away from the mine. Each stroke took about 30 seconds and once in operation these "Bobbing Johns", as they were known, could be left to carry on pumping out the mine around the clock with minimum supervision. 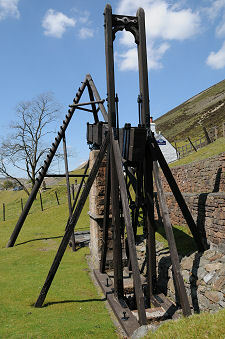 Close to the beam engine at Wanlockhead is a circular track surrounding a cleared central area. This was the site of a horse-engine used to lift ore and spoil out of the mine. It was powered by a horse simply walking round and round the track. The Wanlockhead Beam Engine gives a fascinating glimpse of one aspect of lead mining in the area: for the full picture we strongly recommend a visit to the Museum of Lead Mining.